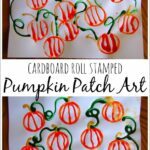 We are gearing up for our annual trip to the Pumpkin Patch and I thought what better way to get excited than with a fun craft! 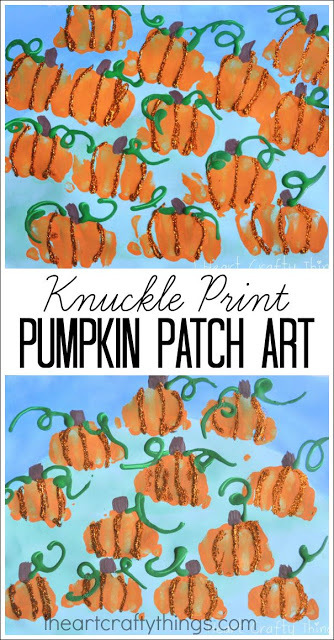 We used our knuckle prints to make pumpkins and created this adorable Pumpkin Patch Art Project. My kids’ artwork turned out so cute! 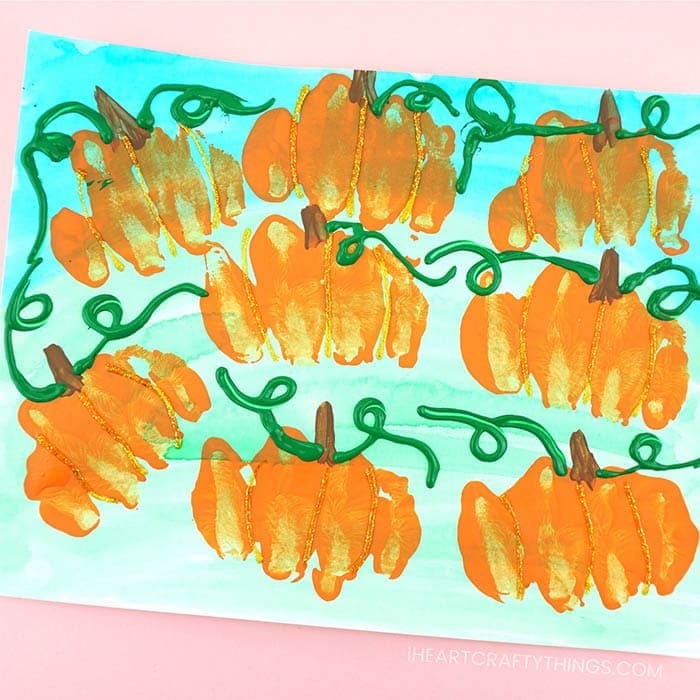 If you are like us and enjoy a trip to the pumpkin patch every October, your kids are going to love making this gorgeous pumpkin patch art project. 1. 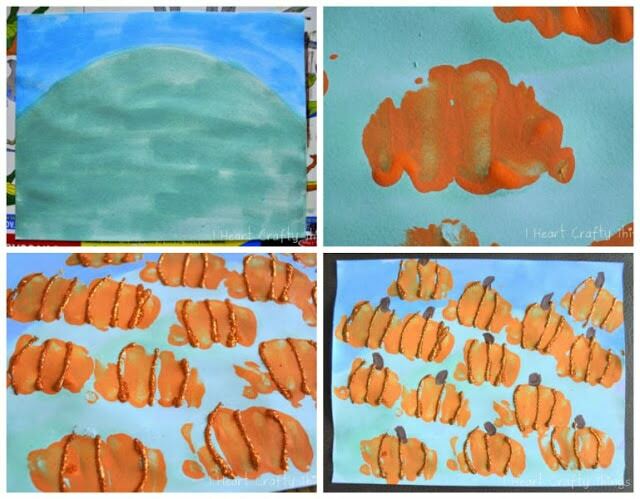 To make our craft we started by using liquid watercolors (watered down a bit) to paint a large hill with sky on top. To help my children, I used a light pencil marking to draw the hill before the kids painted. Set the paper aside for the watercolors to dry completely. 2. After the watercolors are dry, place some orange paint onto a paper plate. Have the children make a fist with their hand. Dip the fist into the orange paint and then press it down onto the hill to make pumpkins. I helped my children press down their fists at first to help them get the hang of it. Children continue dipping their fist into the orange paint and then onto their hill to fill it with pumpkins. Set your paper aside for the paint to dry again. 3. After the pumpkins are dry, use glitter glue to draw lines in each pumpkin along the finger lines of the fist to give the pumpkins dimension. 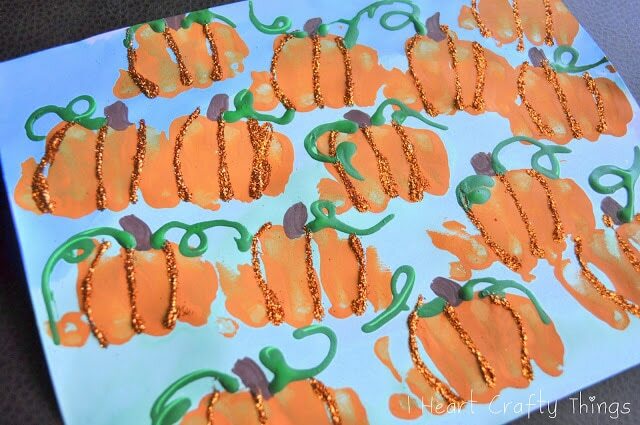 As an alternative to glitter glue, you can use school glue and orange glitter. Glitter glue is much less messy though. 4. Once the orange glitter is dry, pour a small amount of brown paint onto a paper plate. 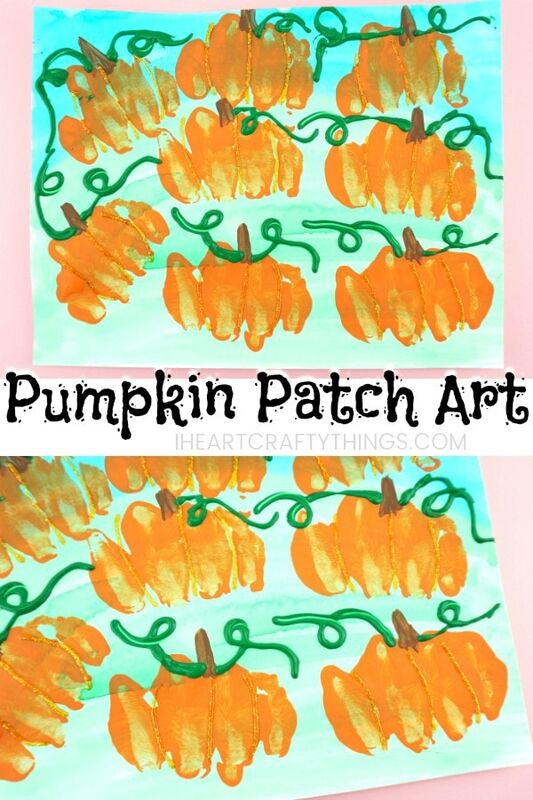 Use a paintbrush to paint pumpkin stems at the top of each of the pumpkins. 5. 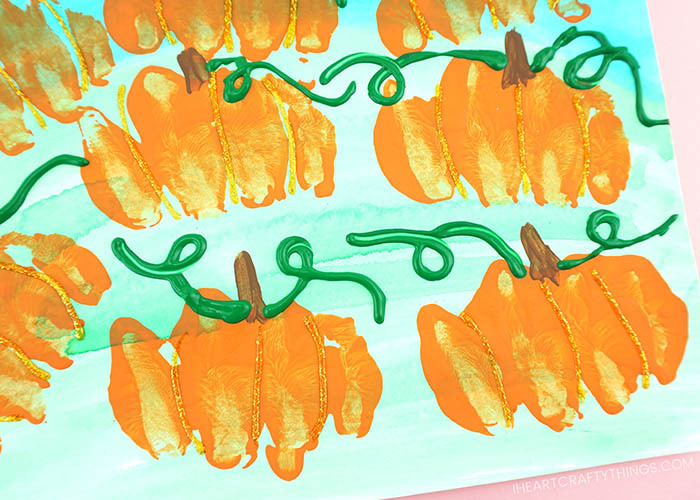 Now use green paint to add some curly vines to each of the pumpkins in your pumpkin patch art project. The trick to making the vines is using one of these plastic squeeze bottles. Simply fill the plastic bottle partially with green paint. 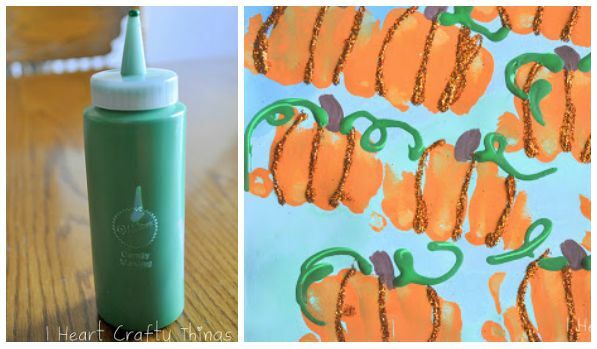 The small tip helps kids be able to squeeze out the paint carefully to make some curly vines on their pumpkins. 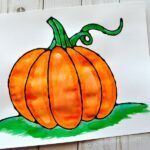 I had my kids practice on a separate sheet of paper to get used to squeezing the bottle and making some swirls before they painted on their pumpkin patch art project. Note: Any leftover paint can be squeezed right back into your green paint bottle. 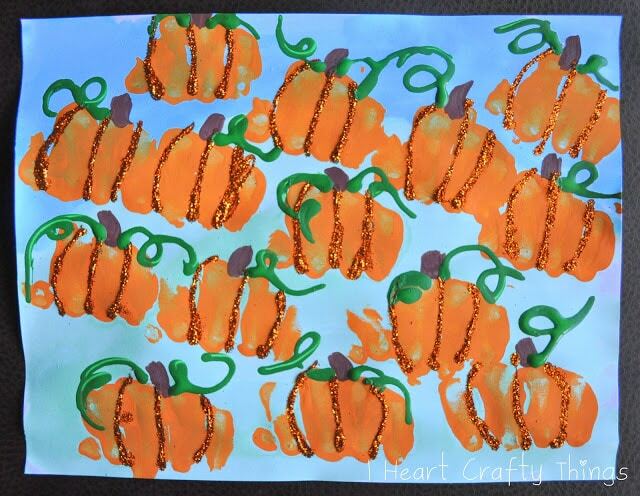 Your pumpkin patch art project is complete! The finished project is bright and cheery and is sure to bring excitement for the fall season into your home! To go along with this craft we read the book Pumpkin Hill by Elizabeth Spurr. 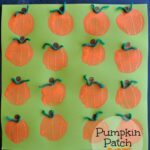 It is a story about how one lonely pumpkin grew plumper and plumper and over time seeds from that pumpkin grew into a huge army of roly-poly pumpkins. A mighty wind sets those pumpkins plummeting downhill and they wake up a sleepy valley town with a delightful rumbling, tumbling surprise. Celebrate the changing colors of the fall season by making this beautiful fall tree paper craft. The leaves popping off the page give this craft an awesome 3D effect. Practice beginning sewing skills my making this plastid lid pumpkin sewing craft. It is another great project to make after visiting the pumpkin patch this fall with your family. Have you ever tried the art technique of combining black glue with watercolors? Here are 7 gorgeous Black Glue Art Projects perfect for the fall season. This is so cute and creative. Pinning it!! Thanks for visiting me and commenting at OneCreativeMommy.com. I'd love it if you linked up some of your great ideas at One Creative Weekend on my site. The party is open Fridays-Wednesdays every week. Hope to see you there! What a neat idea! And I love that you tied it into a book as well. They turned out great! We tried making the fist pumpkins last year and they didn't look like pumpkins at all. Adding the glittered lines would definitely help. We'll be trying that this year! Thanks! We will definitely be doing these pumpkins! Adorable. These look amazing! What a great idea! Oh, I love them!! Thank you for sharing at Sharing Saturday!! Such a cute idea! Can't wait to try it out 🙂 Keep up the great work! I love this idea. It looks brilliant. Featuring YOU today over at Artsy Corner!!! Come see what I had to say about your awesome project and grab a button! You earned it!